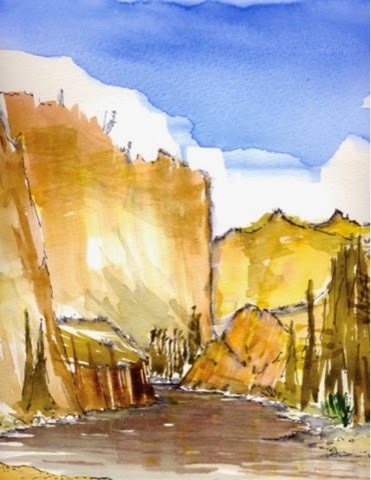 WHITEWATER WATERCOLOR ~ A mostly accurate tale with the fullendorsement of Mr. McFadden by F. Wes Breitenbach | DBP MAGAZINE ONLINE The World's Best Free Whitewater Publication. This is my account with the rare and elusive water color painter, river guide, environmental advocate, and all around good guy Greg McFadden. This month DBP has been looking at the way art and the river meld together. There are many ways we harness the power of the river and many more ways we express our love for that connection. We held a March art contest, “mATRch”, to help bring to the surface fellow paddlers who have an extra special way of expressing their passion. We saw everything from wood burning and carving, water color, photography, glass etching, to hand painted patches from hypalon! We saw more then we could have imagined. And for that we thank you! Everyone who participated is a winner! Even the ones who just admired the art as it was featured, gained some insight into the community of paddlers to which they belong. I hope that you consider these artisans through the year as you look for birthday and holiday gifts. I would be so bold as to say, I bet a few of them would sell you some of their work. How cool would that be,? A triple gift! The person receiving the gift, the person you purchased it from, and you for feeling good about supporting your community! All WINNING! Speaking of winning, the winners of the mARTch CONTEST have been released so congratulations to them! 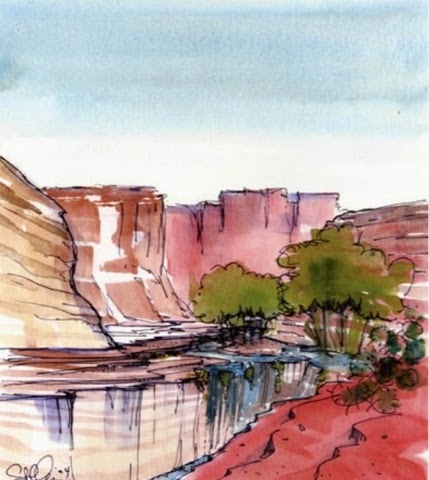 All of the top selections will receive a print of “Above Vail” by artist Greg McFadden, courtesy of Cascade Outfitters! I knew that was cool! What I didn’t know was who he was. 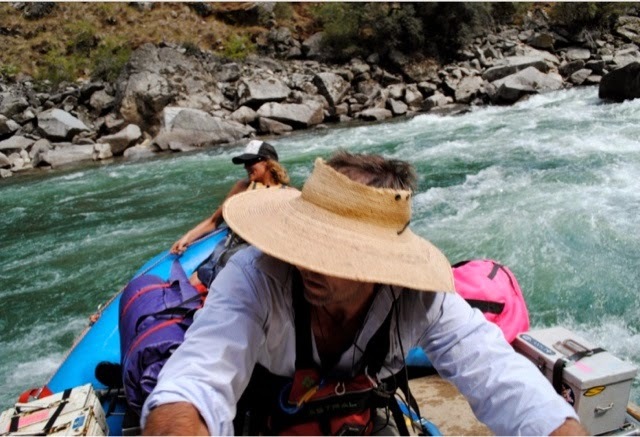 Yes, he is a river guide, rafting outfitter owner, and a water color artist, but what else? So I reached out to Mr. McFadden to answer the hard hitting questions. And after a week or so of hunting him down I finally got some answers. See, Greg is not a hard guy to talk to. He was very willing to talk, but getting him with some down time is no task for the easily broken. This is a man on the move and with a mission. DBP: How does one decide to take water color painting supplies on a rafting trip? How did all this start? GM: Well, I have always sketched. Ever since I was a child I would draw. I used drawing as a way to journal, though I didn’t know it at the time. I had many volumes of sketch books through high school and also from all the time I spent traveling around as a young man discovering the world. Many things happened to me in life that led me to guiding raft trips on the middle fork in Idaho. 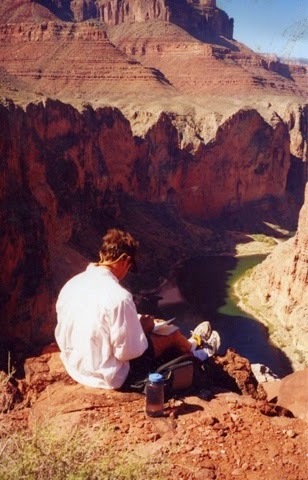 Then one day while on a river trip I found myself on a ridge with a customer and his younger son. The man was painting with watercolors while I was sketching. He leaned in to me and asked “what are you doing”? then suggest that I “try this”. In his outstretched arm was a paint brush. That moment was a turning point in my life. DBP: What kind of art background do you have? GM:My only formal training was a design school in Boulder. I went to for architecture not painting. Granted it was the mid 80’s and we were still drafting by hand. But it wasn’t until that day, on that ridge, like a whorl wind, watercolor came into my life. DBP: Who was that guy? Does he know of his influence on you and what you do? GM: Jim Turner, doctor and watercolor artist. We have been friends for somewhere in the 20 year range. He has been my mentor since the moment he handed me that brush. We still travel and paint together. I have watched his kids grow. So yes, he knows his influence on me. DBP: How did your style and technique develop? GM: It was rough at first. A fusion of sketching and painting eventually, over the years, developed into the style it is. Having the colors laying around you. Ash from a fire. The deep orange hue from the soil. Your colors can come from your environment, along with the water from the area I am in at that particular moment. The paintings have a way of capturing the location in a way you can’t get with other art forms. It allows the customer to take with them a real piece of the trip. DBP: Who is your average client? GM: I do show in a few galleries, but most of my work I sell to the people on the trips I guide. There is an experience you get as an artist when you get to see the joy in someones eyes as a painting is created. That same joy goes with the painting and to the customer who will always look at it and know where that spot is and that a small piece of it is in that painting. DBP: How do you get a painting done on a river trip? GM: Most of my paintings average 45 minutes to an hour. Sometimes longer, but I’m a very social artist and enjoy painting in the open with people hanging around. Especially children. In the evenings it is not uncommon for me to end up on the back of my raft working on a painting while kids gather around to watch or try their own hand at it. I encourage anyone to try it. 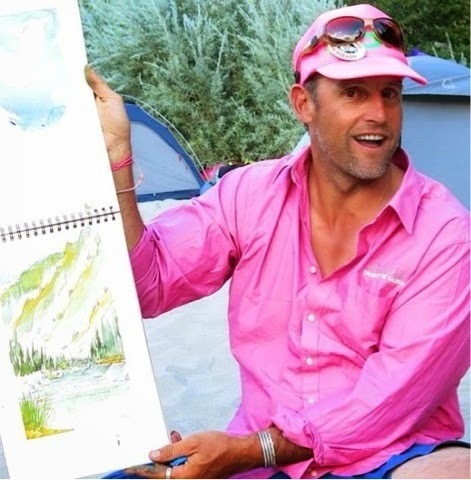 DBP: How do people react to you when you begin to paint in a campsite or on your raft? GM: Most trips have a guitar player or harmonica. Fiddles, drums. You see all kinds of artistic expressions on the river usually through music. People are quite intrigued and it makes for some great conversations. It gets them thinking of what is possible and that you are not limited to any one place to do something. DBP: So, over the past week we have been playing phone tag. I would like to know, what do you have going on that is more important than talking to us? GM: Well, I have been in Washington, D.C. Getting an insiders education on how our government works. I spent several days in meetings with 16 or so Congressional and Senatorial aids working in conjuction with the group America Outdoors. They work to advocate for river related business such as fishing lodges, river and hunting outfitters and others. I was the representative for Idaho. Were trying to keep a level playing field between all interested parties, private and public, as well as for profit and non-profit, who want to have access to the river systems. There is currently a bill proposed that would give non-profits like schools, streamlined permitting. We think every group should have the same chance to enjoy the beautiful resources we work so hard to protect. DBP: I will accept that answer. And from all of us, Thank You Sir! for being one of the people who gets deep into it to really try to make a change. It is saintly work. We went on to talk about the projects he is working on to help bring more kids to the wilderness and how he has been very lucky to be able to give back to not only the community but to the earth itself. Every time we help mother nature remain wild it is a gift to our future. And for you mARTch contest winners, every time you look at that print you will be getting, remember that what you do matters too. You never know who you will inspire and when you will do it. As for Greg, he is an asset to any team and I am glad he was willing to join along side Cascade Outfitters, International Rivers and DBP to make this think so much fun! The paintings shown are the “patio” in the grand canyon and “mile 62” middle fork of the salmon river. One photo is of him behind the sticks pushing his mobile rubber art studio. One is of him in his natural habitat (on the rim of the G.C. painting) and one is of him and a painting after he finished it at a campsite. For those who want more info on Greg McFadden or to see the print “Above Vail” Check out his work.